It’s time to put the final, memorable touches on your 2018 winter wedding. These last-minute choices truly help you weave special themes and endearing moments into your big day. 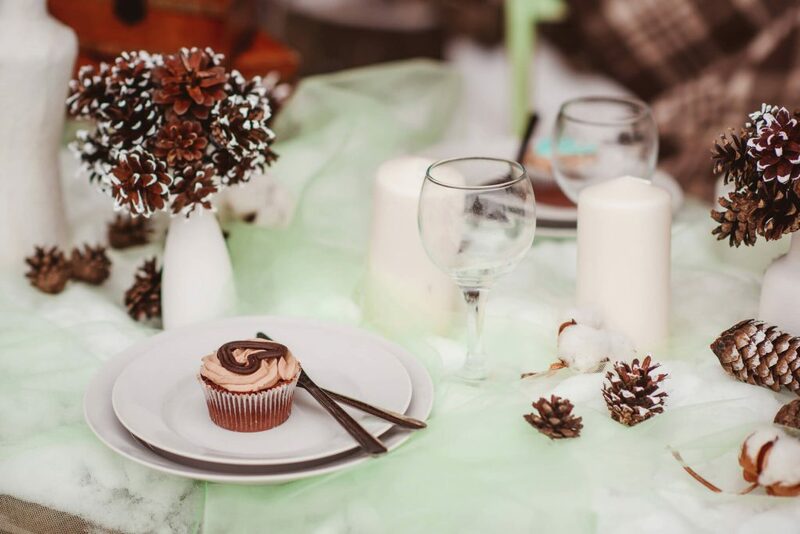 From decor and food to clothing and ceremony, we have several charming winter wedding ideas for you! Help guests shake off the winter chill as they arrive at your ceremony by offering a complimentary hot beverage buffet in the foyer. Warm mugs of mulled cider, hot cocoa, coffee, and tea would surely be appreciated on a brisk day. Continue the winter beverage theme into the reception. If you haven’t chosen a favor for your guests yet, individual packets of gourmet cocoa mix with novelty-shaped marshmallows are a true indulgence they can enjoy later. Or, have a local bakery create winter-themed cookies, each featuring a guest’s name in icing, in lieu of name cards. If your ceremony and reception are in the same building, consider setting up a photo backdrop for guests to snap pictures as they move between the day’s events. Twinkling lights, a decorated Christmas tree, a crafty snowman, or billowing white fabric that resembles snow would appeal to guests of all ages. Or, go all out if the locale allows. Hire a horse-drawn sleigh for you and your beau to travel between the ceremony and reception. Don’t forget to add this to your photographer’s list of must-have shots! By now you’ve already ordered the bridal party bouquets and boutonnières for the gents. Now, let’s customize them to reflect your winter event. Consider adding keepsake charms to the flowers. Have each gift monogrammed and fitted with a tiny clasp so it can later be attached to a special bracelet, clipped onto a keychain, or worn as a pendant on a necklace. Choose a wintry icon, such as a snowflake or snowman, to bring back memories of your winter wedding. Are you handcrafting your programs, table numbers, or menu cards? Give them each a light spray with adhesive glitter to add an icy shimmer. Or, use an ink and stamp set to customize the paper with snow-capped evergreens or cute his n’ her footprints in snow. These tiny touches show off your personality and create a unique presentation for traditional wedding decor. Winter is the perfect season to layer on the accessories. There aren’t many times when you can don these classic, formal extras. For the men, we love to see a handsome lined overcoat worn in outdoor photographs. A top hat and scarf in one of the wedding colors can be added to the mix too. Why not choose cufflinks that reflect the season? We think tiny gift boxes or stars add a personal touch. For the ladies, a sweeping, fur-trimmed cape will not only be cozy, but looks incredible in snowy-background photographs. Finish this look with an oversize matching hand warmer or full-length formal gloves that can be shed just before the ceremony begins to prepare for the ring exchange. Finally, 2018 winter weddings are all about those unique, quaint moments that will live on in your hearts forever. We suggest reviewing your ceremony script ahead of time and asking the officiate if you can mix in a few unexpected touches. We love the idea of asking a special family member to join the couple at the altar to read a poem that reflects love, hope, and the future. Or, initiate an activity that unites the children of a newly blended family. Perhaps they fill a sand vase together or are gifted matching jewelry by their parents in front of everyone. The team at Jim’s Formal Wear is ready to help iron out the details of your wedding day. If you need any last minute formal wear accessories, we’d love to complete your look. Browse our offerings online to find the perfect complements to your winter wedding look!